Christmas 2011 was an action-packed non-stop extravaganza in the parish! So many different events were organised it was difficult to find time to fit them all in. A lot of hard work and preparation was made on the part of those who gave their time so generously. 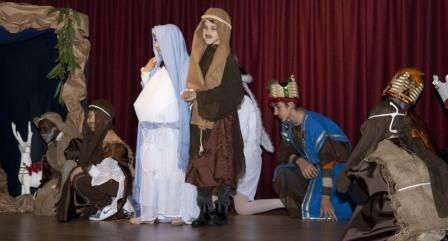 The children performed musical concerts in the Oriens Franciscan theatre which was a delight to all who attended. This was followed shortly afterwards by a splendid Nativity and Christingle play by the children of the parish. Anything performed by the children is always such a pleasure. This year the Mother of our Blessed Lord, in the interests of verisimilitude, wore a well-placed cushion, which to everyone’s amusement slipped spectacularly. Our beautiful little actress carried on like a true thespian – the show must always go on! Well done Tessa! The ladies baked and brewed and produced prodigies of delicious Christmas treats for a buffet supper following the performance, and the evening concluded with a “lucky dip” organised by the Italian Culture group. The evening was enjoyed by all, including our beloved Archbishop who was with us for the occasion. The churches were beautifully and tastefully decorated. Each year we are able to add something new with the creative ideas of those who dedicated their time to beautifying the churches for Christmas. The Fatni, which is the large permanent crib at Sancta Maria, was built by the Italian friars in the 1920s. This year all the figures were moving again. The waterfall and the water-wheel also work to the delight of the many children who visit. It is a well known attraction in Rhodes. We have leaflets in most modern languages which describe the first nativity scene constructed by our beloved Seraphic Father, St. Francis. The liturgy of Carols and Benediction of the Blessed Sacrament at St. Francis’ Church was very well attended. This year the Spanish, Latino-American choir sang and were a huge success, and on December 23rd there was a marvellous Christmas Concert by candlelight in the church at Sancta Maria. We have so much musical talent in Rhodes! These musical events are true expressions of ecumenism. The choirs are composed of Greek Orthodox, Protestants and Catholics and this cooperation and fraternal collaboration is an example of the desire for unity. 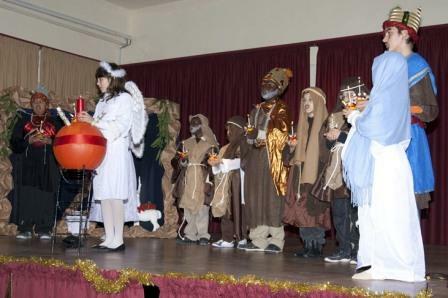 Meanwhile on Kos a retired school teacher, Mrs. Susan Harrison had organised for the first time since 1948, a Christmas play with the Children. The children were protestant, Orthodox, Catholic and Muslim from our Turkish community. Christmas gives joy to all!